A red door attracts good fortune, according to feng shui. Bagua mirrors belong on the outside of the house, usually over the front door or main entrance of a home. In feng shui, the bagua marks the auspicious energy zones of a location, typically the different rooms or areas of a house. Baguas are used to manage chi - positive energy - and powerful bagua mirrors attract and deflect energy leading to the front of your home. The front door is where chi enters your home. Feng shui holds that the flow of positive chi toward your door is affected by sha chi, or poison arrows, which are negative energies. A poison arrow might be the sharp corner of a nearby building, a lamppost or street sign, a road that seems to head directly at your door, a cul de sac. You need a mirror over the door to deflect or reflect that bad energy and to lure the good energy in. There are three bagua mirror shapes, and each has its own characteristics. The glass in a flat bagua mirror is not curved in any way. The mirror sits inside an eight-sided frame painted with the bagua colors and trigrams. The bagua contains yin-yang energy and the symbolic essence of the elements: earth, fire, water and air. Baguas balance, protect and adjust life energy by helping to structure space. 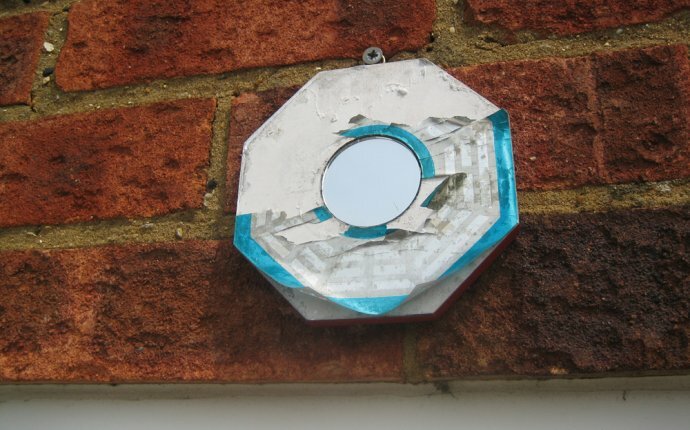 Flat bagua mirrors are an all-purpose feng shui cure for poison arrows and may be hung over the front door - or near it - in a direct line with the offending projectile or traffic flow. You should never hang a flat mirror of any kind inside the front door, because it will stop the entering chi and send it back out the door. A convex mirror multiplies chi and reflects it. This is a strong cure and should not be used lightly. If a large building angles a sharp edge toward your door, the convex mirror will reflect that piercing or cutting energy back. Feng shui practitioners recommend that you never place a convex mirror without consulting a feng shui expert. The repelling action of the mirror is considered somewhat aggressive - if your mirror bounces bad chi back to its source, the source could just send it again, and the volley of bad chi would disrupt good energy flow in the area. Concave bagua mirrors draw good chi into their curve or basin, and collect it. A beautiful outdoor view of scenery such as distant mountains or a river gives off positive chi, and a convex bagua mirror will gather that energy for your home and for anyone who enters there. Another use for the convex mirror is to neutralize poison arrows by drawing all the negative chi into itself and rendering sha chi harmless. The bagua frame - its octagonal shape and its traditional symbols - creates a force field around the exchange of energy in and away from a bagua mirror.